Kazuri West wanted me to test their new holed ceramic discs for a tree of life design. I could not resist the challenge. These discs had several holes along one half of the edge and a solitary hole on the other side. 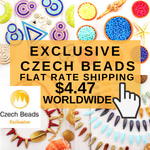 Beaders might typically have the holes at the bottom for hanging several dangles. But Paulette Walther of KW is right, turning the discs upside down makes them excellent foundations for a 3D tree of life pendant. 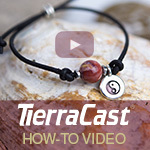 I used a prototype disc for this tutorial. 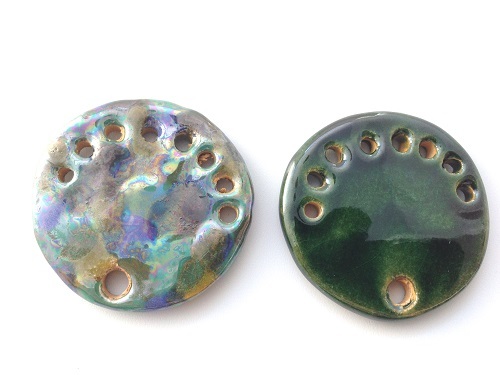 But here is what the final 2 inch ceramic discs look like - gorgeous mottled colored and plain green ones. The holes were the anchor points for wire work. They were generously sized which is unavoidable given the production limitations. 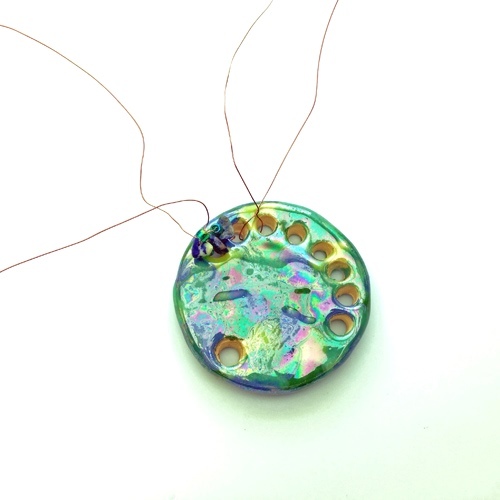 You can use any type of beads and colored wire. 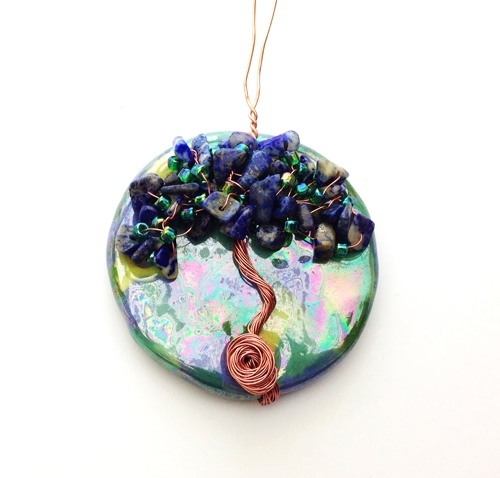 I used small turquoise chips, seed beads and 28 G coated copper wire for the tree itself. 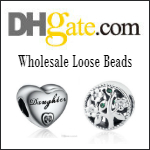 You can use thicker gauge wire but 28G is easiest to manipulate. First cut an 8" length of 28G wire. Double it up and working from left to right, put the ends through holes 1 and 2. The wire bend will be at the back of the work. 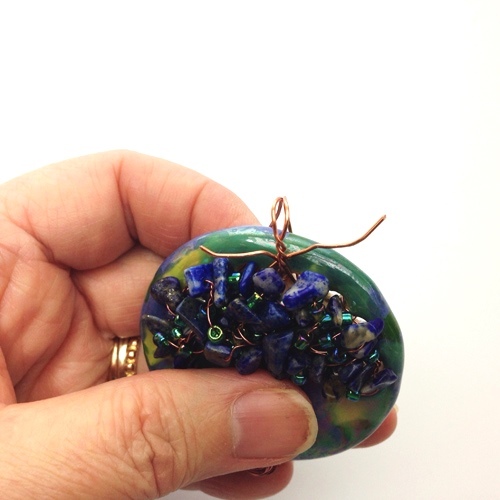 Pinch and twist together a few times the wire ends at the front of the piece. 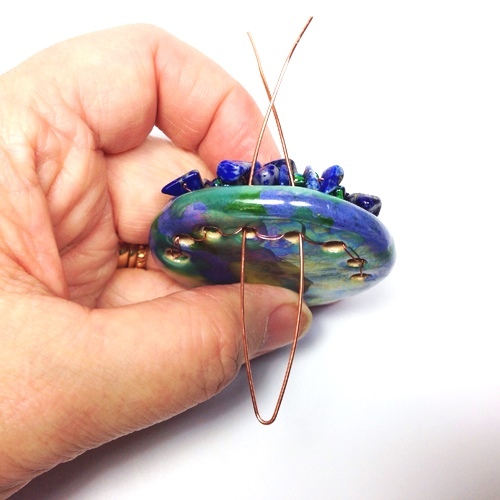 Add a couple of beads on each wire. Cut another length of wire and feed it through holes 2 and 3. 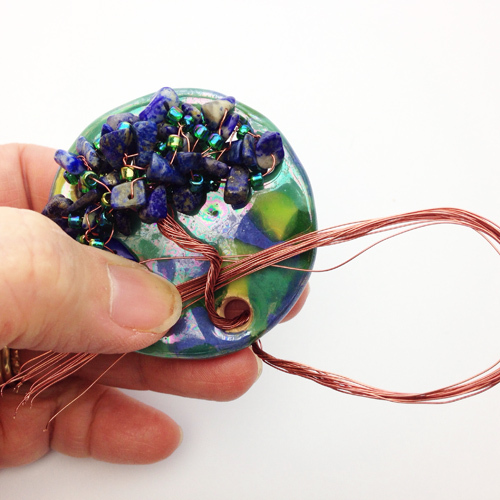 Add beads to the wire ends of the second wire. 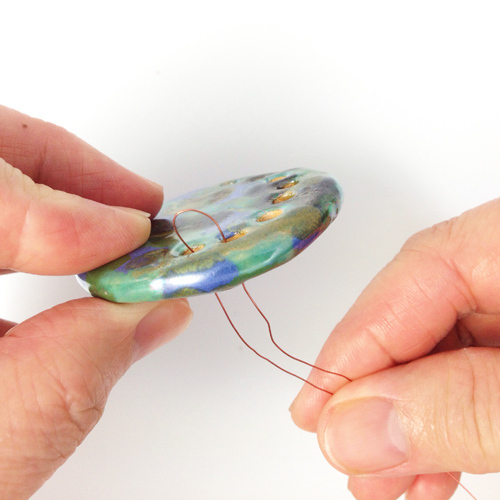 Then pinch and twist together the adjacent wire ends in the middle. 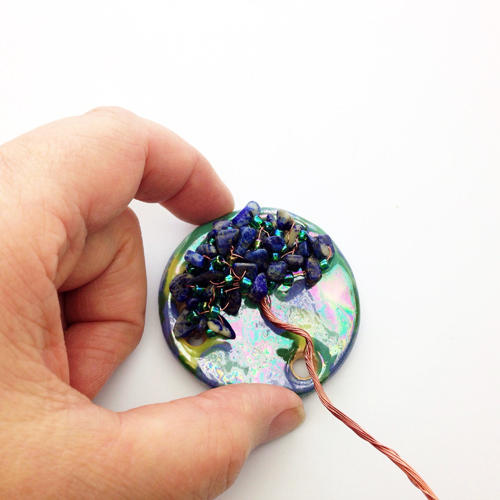 Continue adding more wire lengths (and beads), pinch and twisting adjacent wires, until all the holes are used up. Thread more beads to the wires, pinching and twisting wires to set them in place. Work so the "leaf" part of the tree looks as full as you want. 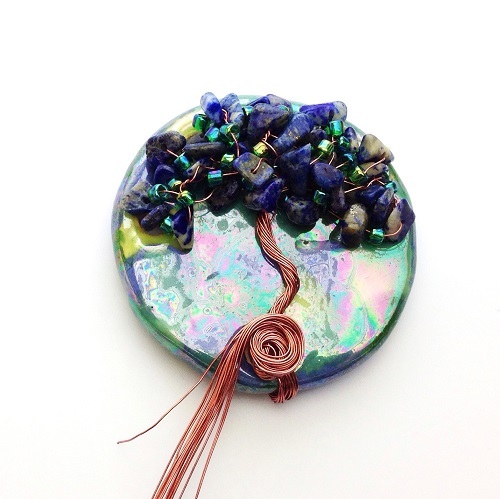 When you have added enough beads, twist all the wire ends together and shape into a pleasing "tree trunk". Use the solitary hole at the bottom to anchor the wire bundle. How you finish up these ends is up to you. Here I just formed a wire rosette by spiralling the bundle. After I trimmed them, these wires were then tucked out of sight under the rosette. I used my nylon jawed pliers to press the rosette as close as possible to the disc. 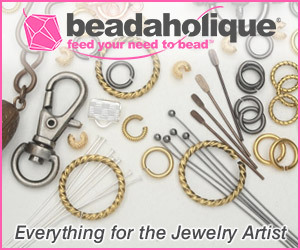 As the holes are so big, it is easy enough to use jump rings to secure to necklace bails. But you can also wire a bail. Here is how I made a quick and easy bail. First cut a 5-6" length of 20G copper wire. 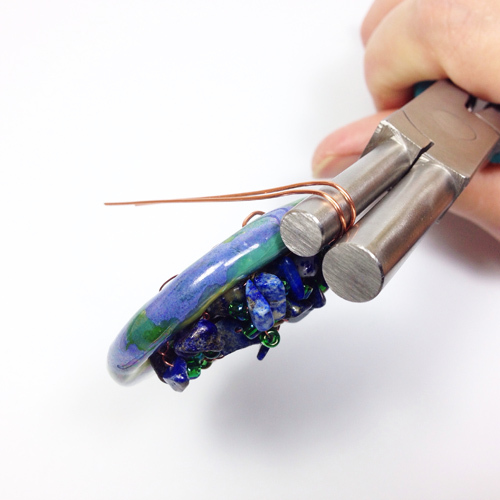 Double it up and feed the ends through 2 central holes to the front of the pendant. Twist the wires a few times. Use a dowel, or even better, a large bail forming pliers to fold over the wire ends. Trim the wire ends if necessary. Bring the wire ends forward via the same holes. 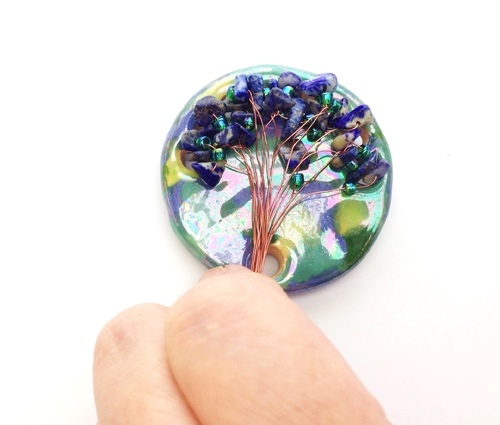 Twist them 1- 2 times, trim and tuck the ends beneath the beads so they cannot be seen. Or just make small spirals like I did. 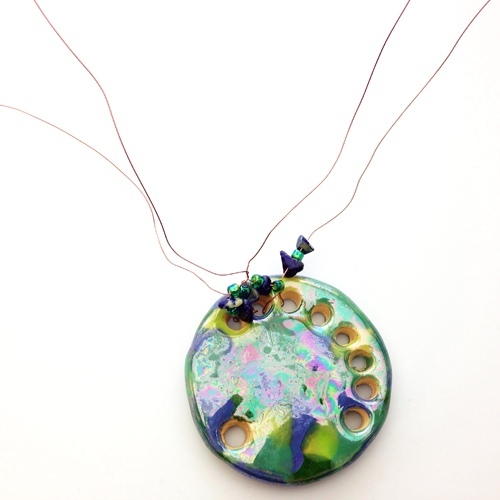 Then slip the pendant onto a necklace or chain of your choice and you are done! You could also just make one and use it as an ornament! Disclosure : I received some ceramic discs from Kazuri West but not any compensation for writing this free tutorial. 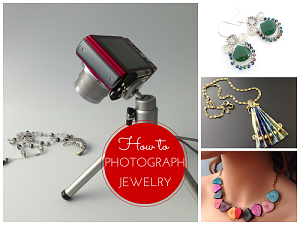 Great use for those Kazuri pendants! Thank you for the tutorial! I've always liked the Tree of Life - and this certainly makes it look easy!